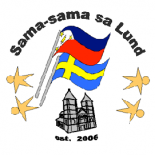 Sama-sama Sa Lund celebrated the halloween festivities in 2015 with two events. First, we had a Halloween kitchen day on October 18 with kids, where we all baked spooky, halloween-themed treats and we also carved our own pumpkins. We also made new friends as one of our SSL members, Mitch De Leon, brought Dr. Khalid Ashaar and his family, who have recently migrated here from Syria via Turkey. Mitch, as usual, gave such kind words to us after the workshop. Thank you, Mitch! Then we had our annual Halloween party on October 24, where everyone was encouraged to come in costume. Thank you to everyone who came to the events! We hope you had a lot of fun!